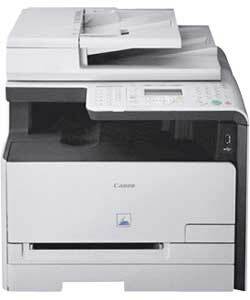 Canon i-SENSYS MF8030Cn All-in-One Printer. Network ready, easy to use and energy efficient, it puts professional colour quality within the reach of small businesses or personal offices. Conveniently scan straight onto a Memory stick using the built in USB port. Printer: •A4 print speed - black text: 12ppm. •A4 print speed - colour text: 8ppm. •Up to 2400 x 600dpi print resolution. •150 sheet paper capacity. •Uses 4 ink cartridges. Scanner: •9600 x 9600dpi optical resolution. Copier: •Reduce and enlarge function. •Card slots:, Memory Stick (MS). Connectivity: •USB (cable not included). General information: •LCD display. •Preview screen. •Compatible with Windows 2000 or later. •Compatible with OS X v10.4 and higher. •Size H80.1, W67.4, D122.9cm. •Weight 25kg. •EAN/Barcode: 8714574537955.